Tom Rysinski/Pahrump Valley Times Prizes available at the Pahrump Valley Youth Golf Founders Club’s annual Quarter Auction on display in the Grill Room at Mountain Falls Golf Club. 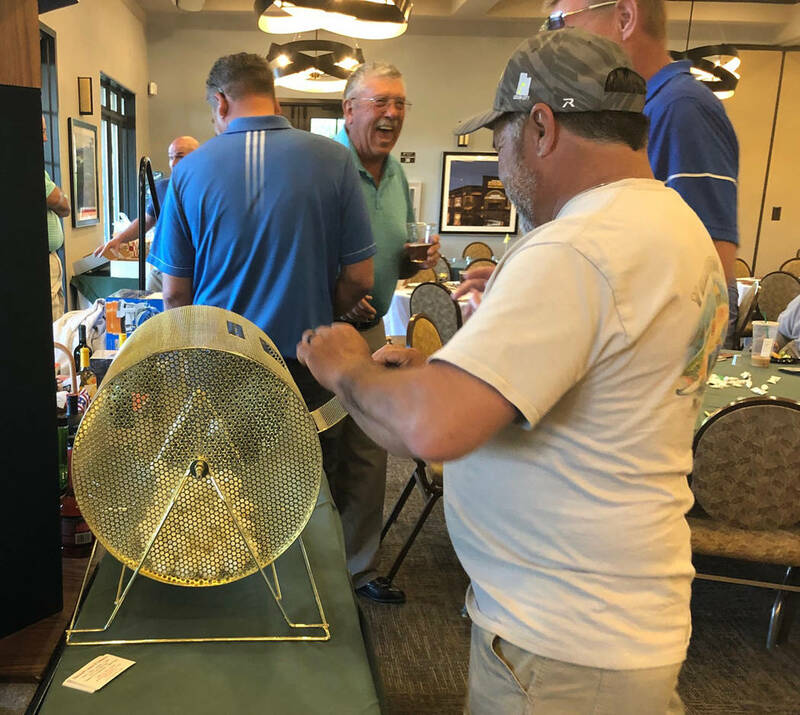 Tom Rysinski/Pahrump Valley Times Pahrump Valley Youth Golf Founders Club President Larry Goins, second from left, in the Mountain Falls Golf Club's Grill Room as a participant in the Quarter Auction places his numbered ball into the hopper Saturday night. Tom Rysinski/Pahrump Valley Times The Grill Room at Mountain Falls Golf Club fills up as the annual Quarter Auction to benefit youth golf programs nears Saturday night in Pahrump. After 24 years, it’s one of the annual events those involved in golf in particular and youth sports in general anticipate as a highlight of the Pahrump social calendar. 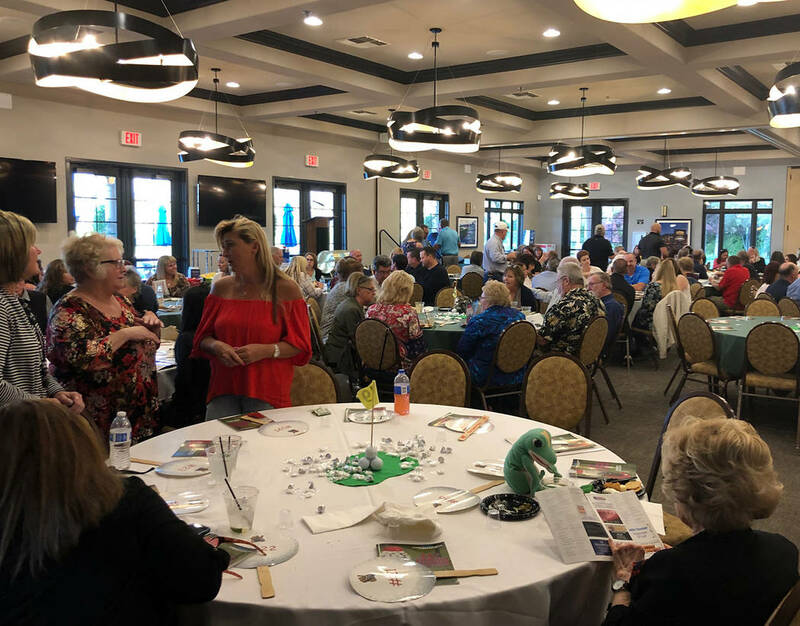 The Pahrump Valley Youth Golf Founders Club’s annual Quarter Auction brought more than 200 people to the Grill Room at Mountain Falls Golf Club, but its roots are a bit more humble. The name stems from using quarters to indicate interest in bidding on a certain item, but there are some drawbacks to that procedure. Remembering the days of using quarters brought back some memories for the Goinses, including one involving Las Vegas Review-Journal sports writer Todd Dewey. While the name has stuck, the procedure is simpler these days. The $60 ticket price entitled attendees to a paddle and a ball, each marked with a number. Participants dropped their ball into a hopper at the front of the room, and numbered balls were drawn for each of the 161 prizes. Abandoning quarters did not guarantee a foolproof event. “Probably about 10 years ago, we’re all sitting at the table and it’s the first break of the Quarter Auction,” Elaine Goins said. “And Larry Thompson — Wilma’s husband — is like, ‘Damn, I never win.’ And we’re like, ‘What is in your pocket?’ His ball. He hadn’t put his ball in the hopper. The event has moved from the Knights of Columbus to Lakeside Casino & RV Resort to the Pahrump Nugget and now to the Grill Room at Mountain Falls. And while a crowd of a little more than 200 might not seem huge, participants have enjoyed it so much over the years they take steps to ensure they are not left out. In fact, how big of an event the Quarter Auction has become was once a source of some competitiveness. Friendly competition, Elaine Goins said, noting that the Thurlows have served on the club’s board and that their son, Michael, went through the junior golf program. And youth golf is the whole point of the Quarter Auction. Nobody was feeling devastated Saturday night. Just before the auction began, Quarter Auction committee member Liz Fraser, who was helping staff the table at the Grill Room’s entrance, said 198 people had purchased a paddle, with a few more expected to be fashionably late. Do the math and it’s 198 people paying $60 per ticket, totaling $11,880, and that’s before the 50/50 and any separate items that might be auctioned off during the proceedings. 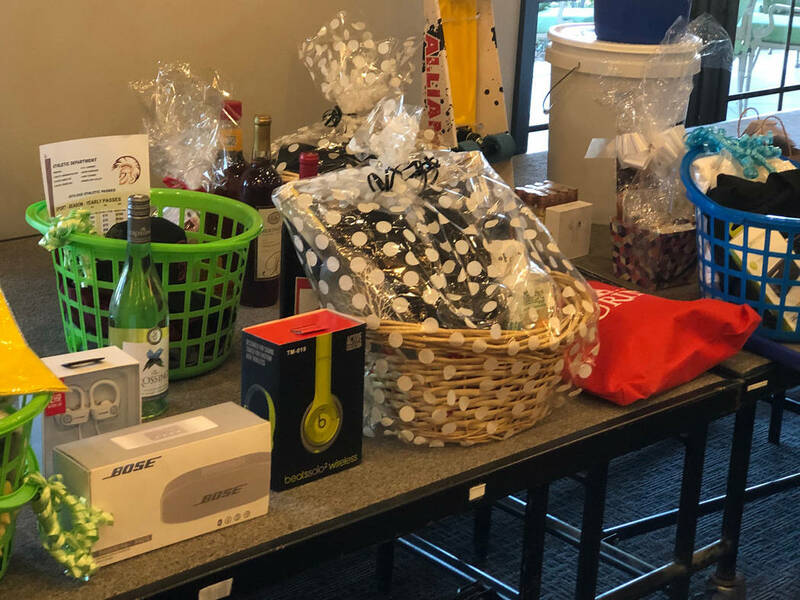 There was a wide variety of prizes on the table Saturday night, from rounds of golf and golf equipment to a cake from Dairy Queen to gift certificates and cash. “We’d be remiss if we didn’t talk about the donors,” Larry Goins said. “When the Floyds had Ace Hardware here, Julie Floyd, who was the girls high school golf coach, was very instrumental in helping us do this. They would give her carte blanche to walk through and pick out what she wanted. So we always had a display. One year it was a whole tiki bar. No horses exchanged hands Saturday night, but for the 24th time a couple hundred people got together to have some fun, win some prizes and help youth golf in Pahrump.